Nestled at the foot of Ca u Mountain in An Giang Province, Banh Xeo (Pan Cake) Pagoda is one of the most popular spots for tourists to Tinh Bien border gate area. 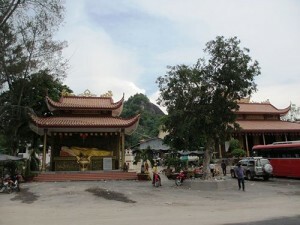 The pagoda was formerly called Phat Nam Pagoda as it has a six-meter-long lying statue of Sakyamuni on the right side. Now it is more impressive with a huge statue of Bodhisattva on the left side in the sanctum with a rock-garden with murmuring streams. The pagoda is also highlighted by skillfully-carved bas-relief, paralleled sentences and patterns on walls and pillars. The pagoda boasts authentic Oriental architecture with a curved-tiled roof and yellow as its main tone color. People call it Banh Xeo as pilgrims are served pan cakes and banh tet(cylindrical glutinous rice cake filled with green bean paste and fat pork) with their free admission. Therefore, every day, around 40 cake makers head there to prepare for visitors. The restaurant at the pagoda can serve 300 guests at the same time. After visiting the pagoda, burning some incense and filling up your stomach with pan cake and banh tet, tourists should then trek up to the mountain’s peak to take in a panoramic view over Tinh Bien District with immense rice fields, imposing mounts around and scattered with houses along trails lined by orchards and water coconut lines. The fresh air and stunning and peaceful surroundings promise to give you carefree moments, fleeing away daily stresses. From HCMC, tourists head along National Highway 1A to the Mekong Delta, passing over My Thuan Bridge in Vinh Long Province to turn to National Road 80 to Sa Dec Town in An Giang Province. Then tourists head to Vam Cong ferry toLong Xuyen City, leading to Chau Doc-Tinh Bien border gate township on the 270-kilometer journey.